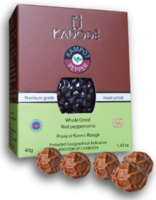 When you buy KADODÈ pepper, you’re getting pepper of the highest quality, of the finest taste, authentically produced with exacting standards by farmers of the Kampot region, with 400 years of experience behind them. Below are the different types of KADODÈ Kampot Pepper we offer. The Process: When the pepper berry starts to mature, the dark green berry becomes slightly yellow. The berries are handpicked and dried naturally in the sun, where the outer husk of the berry turns hard a black. The Taste: Initially bold and powerfully peppery, you’ll notice hints of flower, eucalyptus, and mint. The Finish: Simply grind fresh black Kampot pepper on salads and pastas, or over red meat or seafood dishes. The Process: A fully mature pepper berry turns a bright red on the vine. After the berries are handpicked, the white core is extracted and dried naturally in the sun. 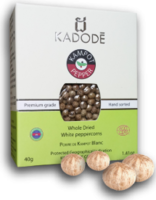 Kampot White Pepper is very different from common white pepper that is mechanically processed from unripe peppercorns. You’ll taste the difference immediately. The Taste: Strong and spicy, with traces of fresh herbs and lemons. The Finish: Add white Kampot pepper to light sea food sauces, or grind it fresh over fish fillets, salads, and vegetable recipes. The Process: As with white pepper, red pepper uses the mature red pepper berry. The berries are handpicked and dried naturally in the sun, where the outer husk turns a dark red. The Taste: An entrancing combination of spicy black pepper and sugary sweetness, with a powerful and fruity aroma. The Finish: Grind fresh red pepper on almost any dish, from salads and pastas, to red meat and poultry, and even on desserts. on all orders over $100 to Canada and the US!! $15 flat rate shipping on orders under $100 to Canada and the US! 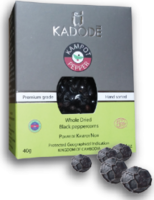 Kampot Pepper offers FREE SHIPPING on all orders over $100. $10 flat rate shipping on orders under $100. Offer applies to deliveries within in Canada only.